As part of my class on “Quantitative Analysis in Political Science,” we asked Bowdoin students to list all of the media that they trust to obtain reliable news about current events and politics. We also asked them to self-identify on an ideology scale of 0 (very liberal) to 100 (very conservative). I counted up the top references to trusted media by three types of students, displayed below. (Self-identification as a conservative is a rarity on campus, so the 51 to 100 category is necessary to have a fair number of students in the count.) 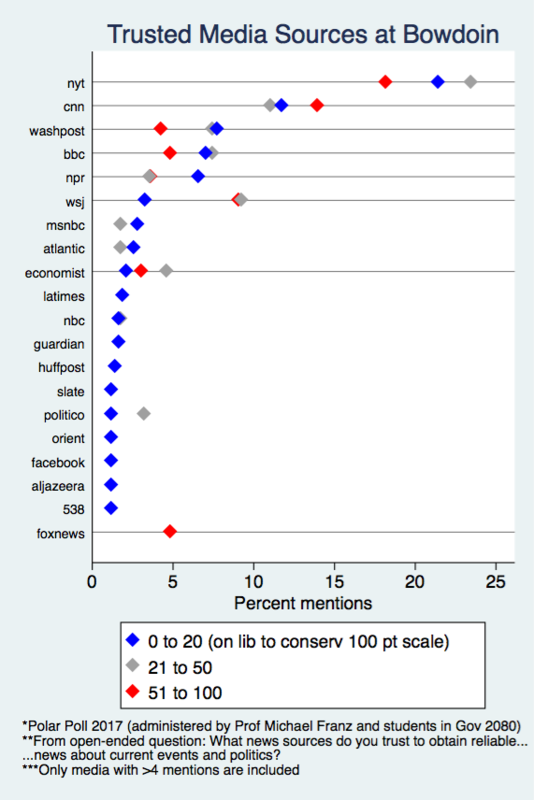 The results are both intuitive (“conservatives” like the New York Times less and the Wall Street Journal more) but also counter-intuitive (not a lot of support for Fox News, and CNN is slightly more trusted by conservative students over liberals). Lots of caveats here…but the results are quite interesting and worth studying more in future polls.